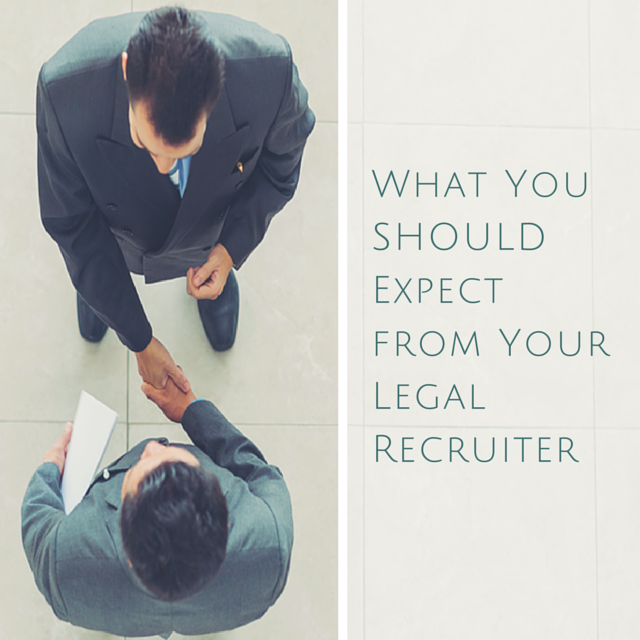 Deciding to work with a legal recruiter is beneficial to your career in many ways. This article summarizes just a few of the things you can expect when working with a recruiter. An effective legal recruiter’s number one goal is to find you your perfect career match. We know the interview and job search process can be a long and laborious one. The effort of visiting multiple employers, answering questions all while keeping a smile on your face can be tough. Many legal candidates are interested about partnering with a recruiter and what the process includes. A recruiter will ask you to come down to his or her office to get to know you in person. Everyone chats via phone, text or email but it’s not the same as talking to someone face-to-face. Recruiters will utilize Skype or GoToMeeting for candidates that can’t make it into the office. Think of your meeting with a potential recruiter as you dating service…yes a dating service. You have a very short time-frame to have them see the best qualities of you, and your experiences, that they can then market to their clients. So, if you are late, rude, aggressive, happy, sad, chewing gum, dressed for a night on the town, still feeling the effects of the party last night; they have ONLY that information to paint the picture that they will then use to find you the right match. So remember to make sure you control how you present yourself during the meeting so that THAT will be what the recruiter will use to find your best match. Whatever THAT is, is totally fine and cannot be judged. Just make sure it is thought out, and deliberate. Discussing the job market at length, and discussing which companies are looking for candidates with your specific specialities, skillset and experience level. Preparing you for interviews and discussing potential questions. Answering your questions as they come up. Assisting you negotiate your final salary and compensation package. A candidate and recruiter have a legal relationship where the candidate is the principal and the recruiter is the agent. The recruiter requires the candidate’s permission to send out their resume, give their name out, and call their references. This is extremely important for candidates that are looking for a new job while currently employed. They don’t want their current employer to find out that they are looking for other opportunities. A legal recruiter should always obtain your permission prior to putting your name forward for a new position. For example, an experienced recruiter will discuss all potential positions with an applicant and will then submit their information to the ones agreed upon. The recruiter will then try to arrange interviews with the clients if the clients chose to meet with them. The recruiter/candidate relationship is very close and in nature hence the recruiter should be in contact with the applicant as soon as they finish a job interview to see how it went. Legal recruiters are employed by law firms to find qualified candidates for various positions. The recruitment company is paid by the law firm after they successfully place a candidate. In other words, as a legal candidate, you don’t pay anything to use a legal recruiter. It’s a win-win relationship. Even though you aren’t paying your recruiter, he or she should provide you with prompt responses to your messages and will keep you apprised of all new opportunities that match your skillset. It is actually illegal in Canada to charge any applicant a fee for placing them in a new position. This entry was posted in Blog, Career Advice, Job Search Advice and tagged career, employment, Job search, legal jobs, legal recruiting, Vancouver. Bookmark the permalink. Post a comment or leave a trackback: Trackback URL.